The UEFA Euro 2020 qualifying tournament is a football competition that is being played from March 2019 to March 2020 to determine the 24 UEFA member men's national teams that will advance to the UEFA Euro 2020 final tournament. The competition is linked with the 2018–19 edition of the UEFA Nations League, giving countries a secondary route to qualify for the final tournament. For the first time since 1976, no team will automatically qualify for the UEFA European Championship as the host country. All statistics correct as of 26 March 2019. There are 55 national teams participating in the qualifying process, with Kosovo taking part for the first time. The draw took place at the Convention Centre Dublin, Republic of Ireland, on 2 December 2018. There will be no automatic qualifying berth, and all 55 UEFA national teams, including the 12 national teams whose countries will stage matches, must compete in the qualifiers for the 24 places at the finals tournament. As the host cities were appointed by UEFA in September 2014, before the qualifiers of UEFA Euro 2020, it is possible for the national teams from the host cities to fail to qualify for the finals tournament. With the creation of the UEFA Nations League starting in 2018, the 2018–19 UEFA Nations League will be linked with UEFA Euro qualifying, providing teams another chance to qualify for UEFA Euro 2020. The qualifying process will guarantee that at least one team from each division of the previous Nations League season will qualify for the final tournament (either directly or through the play-offs). The main qualifying process began in March 2019, instead of late 2018 immediately following the 2018 FIFA World Cup, and will end in November 2019. The qualifiers will be played on double matchdays in March, June, September, October and November 2019. The format will remain largely the same, with 20 of the 24 teams for the finals tournament to be decided by the group stage. Following the admission of Kosovo to UEFA in May 2016, it was announced that the 55 teams will be drawn into 10 groups after the completion of the League phase of the 2018–19 UEFA Nations League, and the draw seeding will be based on the overall rankings of the 2018–19 UEFA Nations League. There will be five groups of five teams, and five groups of six teams, with the four UEFA Nations League Finals participants guaranteed to be drawn into groups of five teams (so they can complete their Nations League Finals in June 2019). The top two teams in each of the 10 groups qualify for Euro 2020. Position in the UEFA Nations League overall ranking. Following the qualifying group stage, the qualifying play-offs will take place in March 2020 to determine the remaining 4 teams for the finals tournament. Unlike previous editions, the participants of the play-offs will not be decided based on results from the qualifying group stage. Instead, 16 teams will be selected based on their performance in the 2018–19 UEFA Nations League. These teams will be divided into four paths, each containing four teams, with one team from each path qualifying for the final tournament. Each league will have its own play-off path if at least four teams have not already qualified in the conventional qualifying group stage. The Nations League group winners will automatically qualify for the play-off path of their league. If a group winner has already qualified through the qualifying group stage, they will be replaced by the next best-ranked team in the same league. However, if there are not enough non-qualified teams in the same league, then the spot will go to the next best team in the overall ranking. However, group winners cannot face teams from a higher league. Each play-off path will feature two single-leg semi-finals, and one single-leg final. The best-ranked team will host the fourth-ranked team, and the second-ranked team will host the third-ranked team. The host of the final will be decided by a draw, with semi-final winner 1 or 2 hosting the final. The four play-off path winners will join the 20 teams which have already qualified for UEFA Euro 2020. Below is the schedule of the UEFA Euro 2020 qualifying campaign. The fixture list was confirmed by UEFA on 2 December 2018 following the draw. The qualifying group stage draw was held on 2 December 2018, 12:00 CET (11:00 local time), at the Convention Centre Dublin in Dublin, Republic of Ireland. The 55 teams were drawn into 10 groups: five groups of five teams (Groups A–E) and five groups of six teams (Groups F–J). Host teams: In order to allow all 12 teams from the host associations to have a chance to qualify as group winners and runners-up, a maximum of two were placed in each group: Azerbaijan, Denmark, England, Germany, Hungary, Italy, Netherlands, Republic of Ireland, Romania, Russia, Scotland, Spain. Winter venues: A maximum of two teams identified as venues with high or medium risk of severe winter conditions were placed in each group: Belarus, Estonia, Faroe Islands, Finland, Iceland, Latvia, Lithuania, Norway, Russia, Ukraine. The three "hard winter venues" (Faroe Islands, Finland, Iceland) cannot host games in March or November; the others shall play as few home matches as possible in March and November. Iceland: with Armenia, Cyprus, Georgia, Israel. The teams were seeded based on the November 2018 UEFA Nations League overall rankings. Teams in italics are final tournament hosts. Teams which fail in qualifying group stage may still qualify for the final tournament through the play-offs. Each league in the UEFA Nations League will be allocated one of the four remaining UEFA Euro 2020 places. Four teams from each league which have not already qualified for the European Championship finals will compete in the play-offs of their league, to be played in March 2020. The play-off berths will be first allocated to each pool winner, and if any of the pool winners have already qualified for the European Championship finals, then to the next best ranked team of the division, etc. The team selection process will determine the 16 teams which will compete in the play-offs. The qualifying play-off draw will take place on 22 November 2019 in order to determine the paths which the non-group winners will participate in. The final hosts will also be drawn between the two semi-final pairings. There have been 154 goals scored in 50 matches, for an average of 3.08 goals per match (as of 26 March 2019). The overall rankings will be used for seeding in the UEFA Euro 2020 final tournament draw. Results against sixth-placed teams are not considered in the ranking. ^ a b Away goals scored: Spain 2, Northern Ireland 0. ^ a b Away goals scored: Switzerland 2, Israel 0. ^ a b Away goals scored: North Macedonia 1, Kosovo 0. ^ a b c Disciplinary points: Cyprus 0, Estonia −1, Malta −1. Nations League ranking: Estonia 37th, Malta 54th. ^ a b Disciplinary points: Azerbaijan –1, Lithuania −2. ^ a b Disciplinary points: Czech Republic −2, Andorra −8. ^ a b "UEFA Euro 2020 Tournament Requirements" (PDF). UEFA.com. ^ a b "Bids for Euro 2020 due today; tournament to be held all across Europe". NBC Sports. 12 September 2013. ^ a b "Dublin to stage European Qualifiers draw on 2 December 2018". UEFA.com. 28 September 2017. ^ "All you need to know about UEFA EURO 2020". UEFA.com. 21 September 2016. Retrieved 10 December 2016. ^ a b "UEFA Nations League/UEFA EURO 2020 qualifying" (PDF). UEFA.com. ^ "UEFA Nations League receives associations' green light". UEFA.com. 27 March 2014. ^ a b "UEFA Nations League format and schedule confirmed". UEFA.com. 4 December 2014. ^ a b "Regulations of the UEFA Nations League 2018/19" (PDF). UEFA.com. Union of European Football Associations. 28 September 2017. Retrieved 5 October 2017. 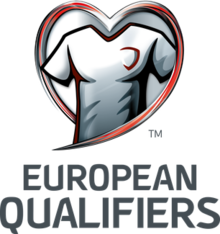 ^ "All you need to know: European Qualifiers for UEFA EURO 2020". UEFA.com. Union of European Football Associations. 2 December 2018. Retrieved 2 December 2018. ^ "UEFA EURO 2020 qualifying draw: 2 December". UEFA.com. ^ "UEFA Euro 2020 qualifying draw press kit" (PDF). UEFA.com. Union of European Football Associations. 30 November 2018. Retrieved 2 December 2018. ^ "UEFA EURO 2020 qualifying draw". UEFA.com. Union of European Football Associations. 2 December 2018. Retrieved 2 December 2018. ^ "EURO 2020 qualifying draw pots confirmed". UEFA.com. Union of European Football Associations. 20 November 2018. Retrieved 21 November 2018. ^ "UEFA EURO 2020 play-offs as they stand". UEFA.com. Union of European Football Associations. 20 November 2018. Retrieved 2 December 2018. ^ "UEFA EURO 2020 play-off draw". UEFA.com.